The calendar and weather are beginning to agree, and both are now saying autumn is here. While daytime highs flirted with the 80 degree mark it was easy enough to ignore first frost preparations, but cold and rain finally came through and it’s time to face the inevitable. 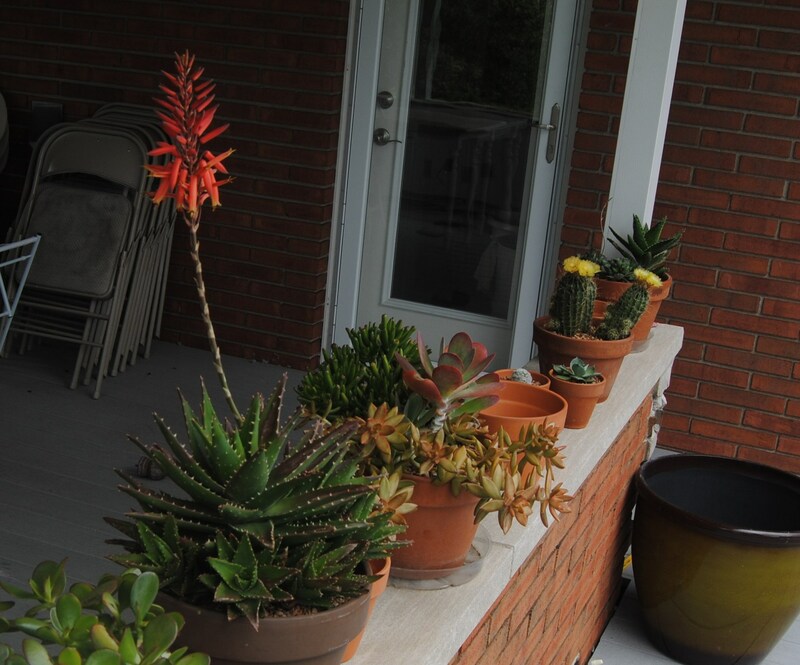 To get things moving I collected all the cacti and succulent pots and staged them close enough to the back door to make things near at hand in the event of some late night freeze emergency. Moving them around might give stray bugs and frogs a chance to find better winter quarters. It’s always a nice surprise to grab a pot rim and find a nice squishy frog instead of gravel. Apparently I was much more disturbed by the incident than this little guy. Where all of these pots are going is still anyone’s guess, but I suspect most will go into the heated garage to sit out the winter on some dimly lit shelf away from any direct blasts of freezing weather. As long as the soil stays dry enough they should settle down into some kind of dormancy that will take them through to spring. Only the tall purplish euphorbia and pinkish pencil plant will stay in the brighter, warmer house (and get a few drinks of water throughout the winter). The summer vacation did them well, and many have come close to doubling in size since I put them out in April. Cacti and succulents always seem so slow growing, but then all of a sudden you have a 5 pound cactus sitting on your windowsill and realize once again ‘slow and steady’ won the race. 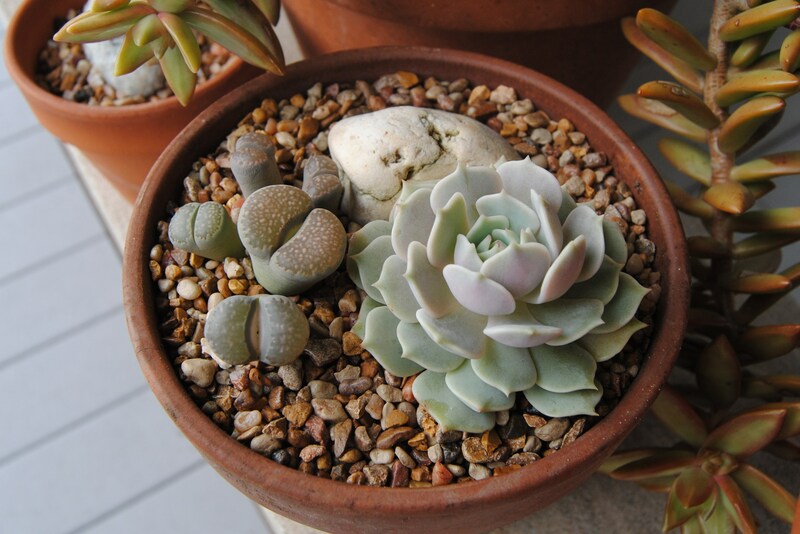 A favorite new addition is this clump of ‘living stones’ or lithops. The name pretty much says it all and I can’t believe everyone doesn’t love these little guys…. little dull pieces of liver, boring stones…. who would say such nonsense! 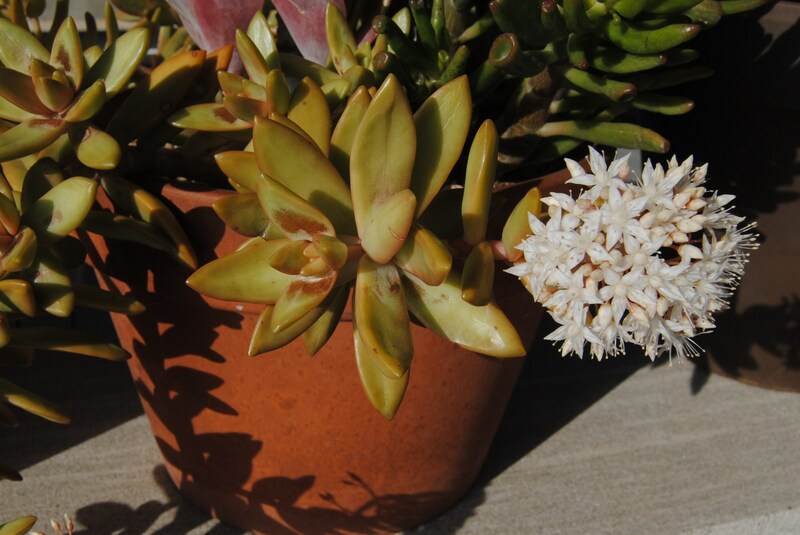 They bloom too, and if you want to start a new obsession, check out this lithops post at the anxious gardener. I hope winter care really is as easy as just a windowsill with no water -because I can do that. This collection grows each year not just from the tiny pots I pick up here and there, but also from the little gifted bits and cuttings that any fellow gardener is almost always willing to pass on. Tiny leaves and pieces dropped into a open spot quickly become new specimens. 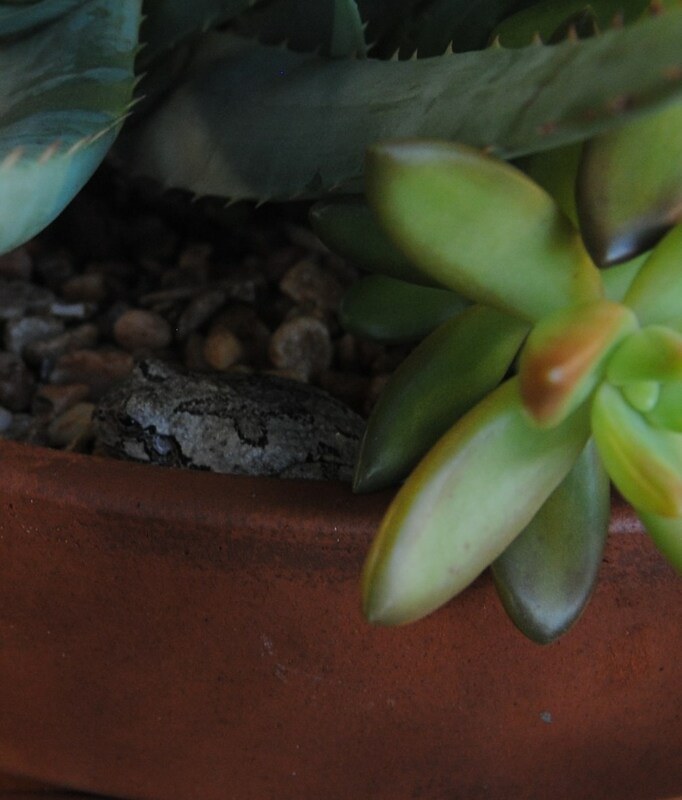 In the above pot there’s a barely noticeable scrap of cactus pad at the lower right of the pot. If it grows I’ll call it Disney magic, in honor of it coming back to life from a shoe trampled bit on the side of a frontierland path…. and so the collection multiplies…. Sure the in and outs of cactus growing are more work than planting a daylily, but my succulents and cactus collection still isn’t out of control. Aside from taking them in for winter they’re as close to no-maintenance as one can get for a tabletop or deck planting… I pretty much rely on rain to keep them going. Maybe when I run out of old fishtank gravel I’ll have to look for a new collection limit but until that happens I think it’s my duty to see how far this can go. Now if only everything else was as easy to winterize! 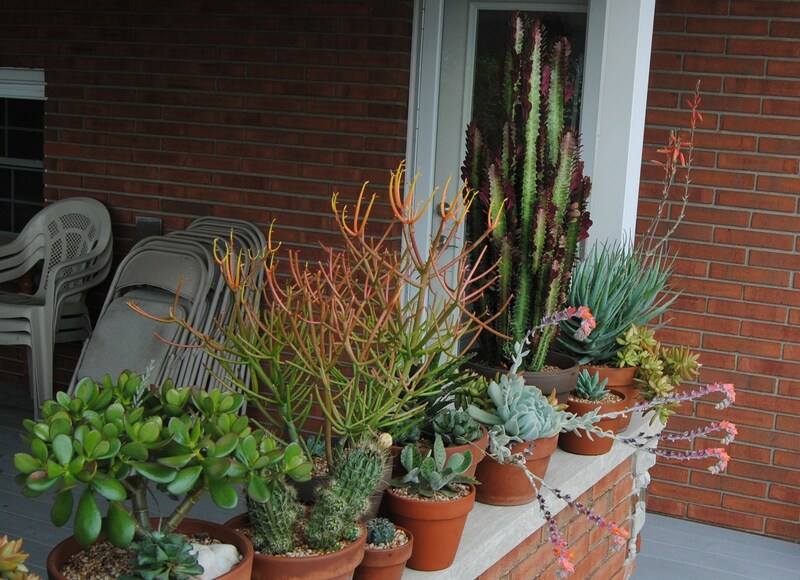 This entry was posted in deck plantings, fall, overwintering tropicals and tagged agaves, cacti and succulents, deck plantings, low maintenance deck plantings, low water deck plantings, outdoor tabletop plants, overwintering succulents, overwintering tabletop cacti. We were definitely going through a period of climactic dissonance. Kind of reassuring for things to be more in sync. Nice collection of succulents, not my thing but I see the appeal. I think if they were more trouble I wouldn’t be as carefree about adding new plants, but for now it’s another collection that is expanding. Annette, I always love a good story! 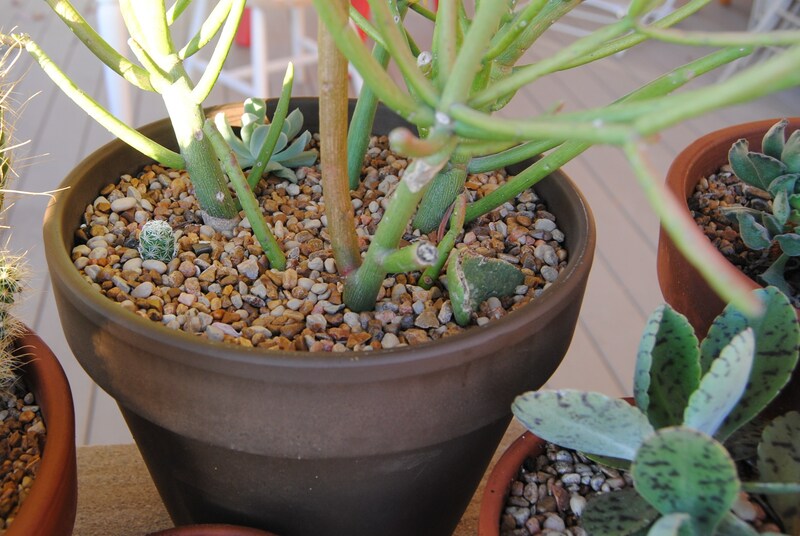 I think if there weren’t other people here keeping an eye on me I would also fill the house with plants… But maybe not cacti, I would need a few friendlier plants too or else I would spend the whole winter pulling spines out of my fingers and elbows and backside! I may have to get serious about a nice gravel patio in the back. 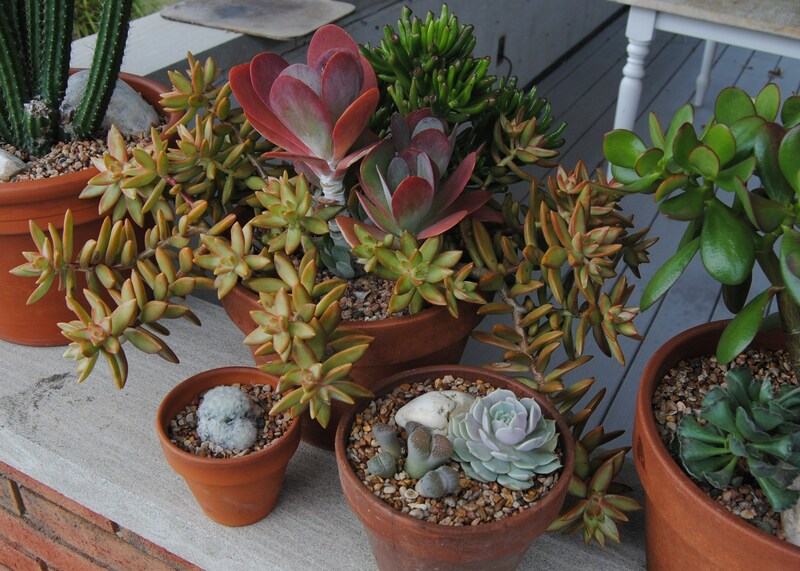 It would be a good spot for a few (and then maybe a few more) pots of sempervivums ;). They seem to get lost in the garden otherwise. That is a wonderful collection! I am propagating a 2 1/2′ cacti that just got too big, and hopefully the little arms take hold so I can get rid of the big one!